Reconstructed convergence maps using Glimpse. 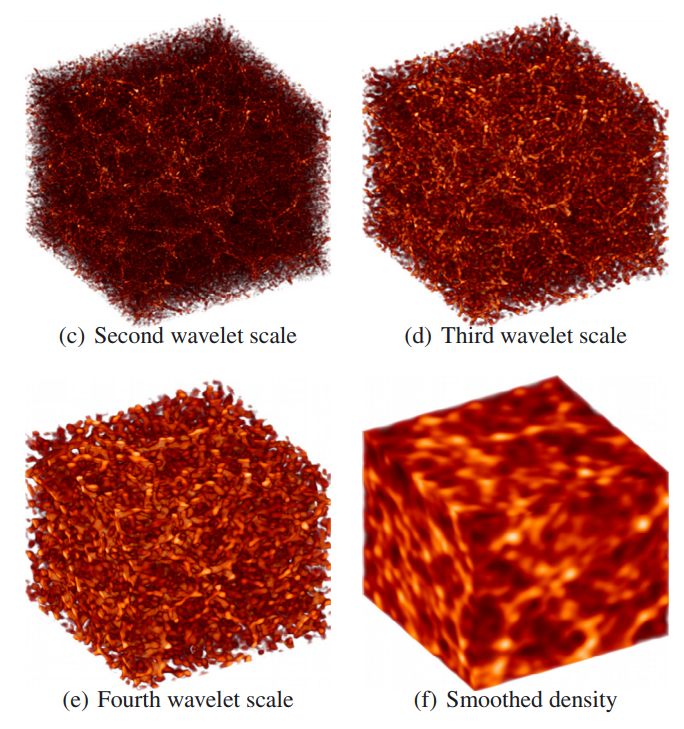 Glimpse is a weak lensing mass-mapping tool relying on a robust sparsity-based regularisation scheme to recover high resolution convergence from either gravitational shear alone or from a combination of shear and flexion. 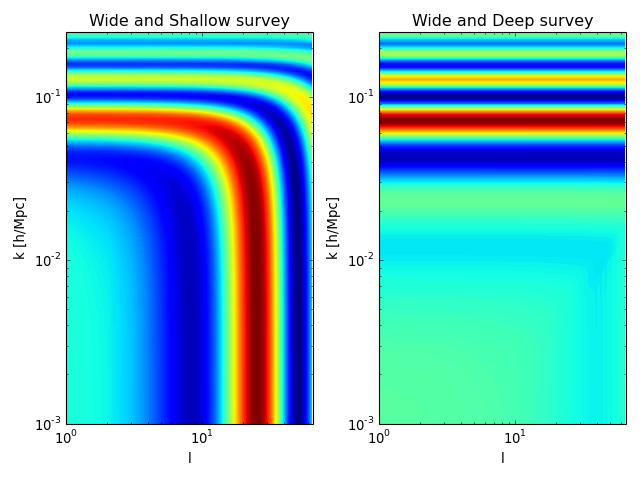 Including flexion allows us to supplement the shear on small scales in order to increase the sensitivity to substructures and the overall resolution of the convergence map. In order to preserve all available small scale information, Glimpse avoids any binning of the irregularly sampled input shear and flexion fields and treats the mass-mapping problem as a general ill-posed inverse problem, regularised using a multi-scale wavelet sparsity prior. 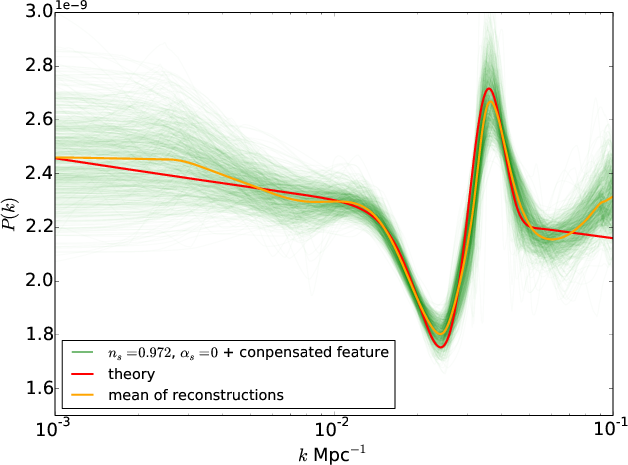 The resulting algorithm incorporates redshift, reduced shear, and reduced flexion measurements for individual galaxies and is made highly efficient by the use of fast Fourier estimators. The source code is hosted on Github at https://github.com/CosmoStat/Glimpse . 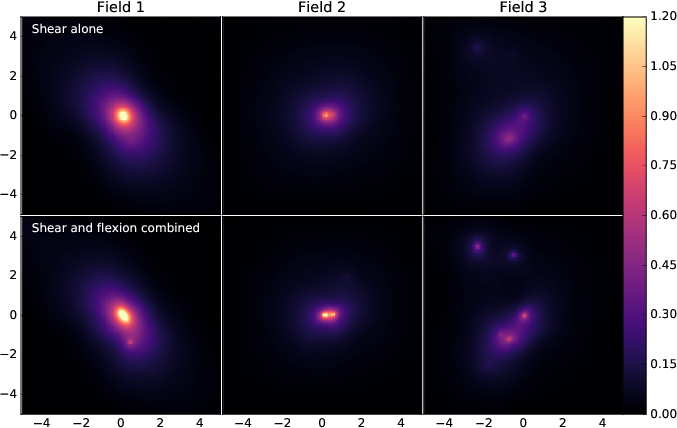 CosmicPy is an Python package which allows for simple and interactive cosmology computations. Designed to be modular, well documented and easily extensible, CosmicPy aims to be a convenient tool for forecasting cosmological parameters constraints for different probes and different statistics. The source code is hosted on GitHub at: https://github.com/cosmicpy/cosmicpy . The primordial power spectrum describes the initial perturbations in the Universe which eventually grew into the large-scale structure we observe today, and thereby provides an indirect probe of inflation or other structure-formation mechanisms. The primordial power spectrum is therefore linked to cosmological observables and in particular the Cosmic Microwave Background (CMB). However, due to degeneracies in the transfer function that links the primordial power spectrum to the measured CMB, recovering the primordial power spectrum constitutes a non-trivial ill-posed inverse problem. Furthermore, the multiplicative nature of the noise on the estimator of CMB power spectrum adds to the complexity of the problem. PRISM is a new sparsity-based, non-linear reconstruction technique which aims at reconstructing global and local features on the primordial power spectrum from CMB measurements. To this end, PRISM integrates a Variance Stabilisation Transformation to handle the non-Gaussian distribution of the angular CMB power spectrum with an \(\ell_1\) analysis-based sparsity prior in wavelet space. Features are detected and reconstructed based on their significance compared to noise. MRS3D is a C++ package providing a library and a set of tools allowing the manipulation of Spherical Fourier-Bessel Coefficients and the implementation of MultiResolution algorithms adapted to 3D data in spherical coordinates. In particular, MRS3D implements a Spherical 3D Isotropic Wavelet Decomposition. As a part of MRS3D, this package also contains the FastDSBT C++ library wich implements a Discrete Spherical Bessel Transform based on a matrix formalism.